National Socialism, commonly called Nazism, German political movement initiated in 1920 with the organization of the National Socialist German Workers’ Party (Nationalsozialistische Deutsche Arbeiterpartei, or NSDAP), also called the Nazi Party. 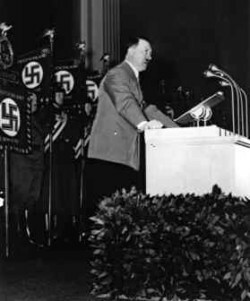 The movement culminated in the establishment of the Third Reich, the totalitarian German state led by the dictator Adolf Hitler from 1933 to 1945. Probably no regime in the 20th century or any other has been so closely identified with institutionalized terror and evil as that of the Third Reich under the control of Adolf Hitler and the Nazis. Its rise and demise had worldwide consequences, and its legacy continued to shape the identity of Germans long afterward. The name given by the Nazis to their government in Germany; Reich is German for “empire.” Adolf Hitler, their leader, believed that he was creating a third German empire, a successor to the Holy Roman Empire and the German empire formed by Chancellor Bismarck in the nineteenth century.